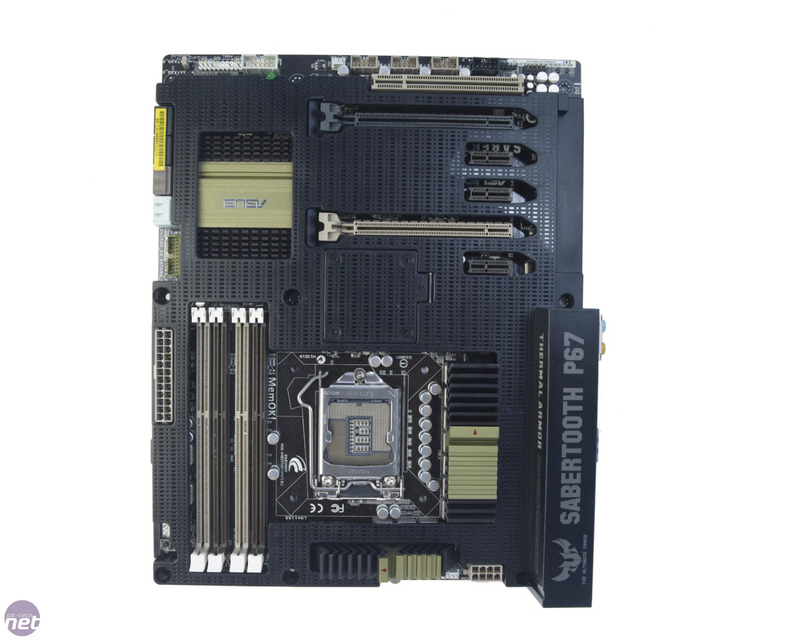 There are plenty of B3 revision P67 boards sitting in our labs at the moment, but the review of the Asus Sabertooth P67is the first one we've decided to publish. This is because the board has been one of the most talked-about LGA1155 motherboards on our forums. You can immediately see why too, as the Sabertooth P67 is extremely visually distinctive thanks to the huge plastic shroud that covers most of the motherboard. 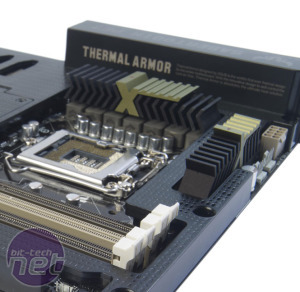 This is Asus’ new TUF Thermal Armor, which is one of the many TUF branded components on the motherboard. TUF stands for The Ultimate Force, and motherboards that bear this moniker are, Asus claims, built to higher specifications than standard motherboards, with the purpose of making them particularly hardy. To reinforce this point, the Sabertooth P67 includes a certificate that details the military-level tests to which the on-board chokes, capacitors and MOSFETs have been subjected. This is all well and good, but it’s little more than a gimmick, as none of the components that you’re going to bolt to the Sabertooth P67 will have passed any of these tests. There are some tangible benefits to purchasing a board in the TUF range, though, such as the extended five-year parts and labour warranty. Asus claims that the primary benefit of the Thermal Armor is to enhance the motherboard’s cooling ability; it’s designed to channel air from the CPU cooler over important areas of the motherboard. In reality, though, this will only work with coolers that blow downwards towards the motherboard in the same way as Intel’s reference cooler - we’d hope that anyone buying the Sabertooth P67 wouldn’t be using such a basic cooler. In addition, the air will be quite warm, having passed through the CPU cooler’s heatsink. The shroud also made it a challenge to fit our test cooler, as it gets very close to the socket mounting holes. Thankfully, it’s possible to remove the shroud by unscrewing half a dozen screws on the rear of the PCB. 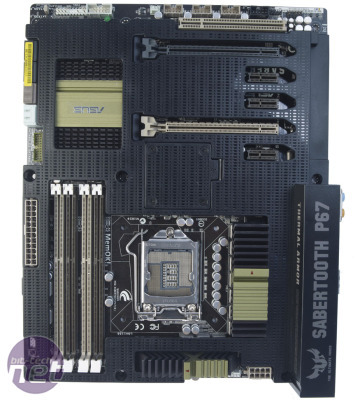 Apart from this, the Sabertooth P67 is a fairly standard P67 motherboard. The two 16x PCI-E slots support SLI and CrossFireX, and there are three 1x PCI-E slots and a single PCI slot, so there’s plenty of room for other expansion cards. It’s clear that proper attention has been paid to the layout of the Sabertooth P67 too, as all the important sockets and headers are located on the edge of the PCB. All the SATA ports are orientated parallel to the PCB too, which aids cable tidying. Meanwhile, the Sabertooth P67's heatsinks are finished in the same ceramic coating that we’ve seen on previous TUF boards, and they're pleasingly chunky. The two VRM heatsinks are also linked by a heatpipe, which means they should share the cooling burden more evenly than on boards with isolated VRM heatsinks. One concern, though, is that the Southbridge heatsink is swamped by the Thermal Armor shroud, and will therefore receive very little airflow in most cases.